This page provides recommendations and guidance on methods for constructing and using probabilistic regional climate information. 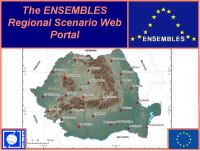 ENSEMBLES moves from "storyline" scenarios to probabilistic information. This marks a fundamental change for developers and users of scenarios - especially high-resolution regional scenarios. Thus the production of recommendations and guidance on methods for constructing and using probabilistic regional climate information is an important part of ENSEMBLES work. D2B.26 Recommendations and guidance on methods for the construction of probabilistic regional climate projections and their application in impact modelling. Rationale for examining probabilistic climate projections in ENSEMBLES. Development of probabilistic climate projections for Europe to apply in IAV analyisis based on ENSEMBLES global and downscaled model outputs. Examples of applying multi-model ensemble climate projections in IAV assessments. A series of ENSEMBLES RT2B deliverable reports provide recommendations for downscaling applications. The ENSEMBLES guidelines build on earlier guidance produced by the IPCC and STARDEX. The site offers general guidelines to introduce and describe the information and analytical tools provided by the IPCC Data Distribution Centre and on the interpretation of the baseline and scenario data. There are also detailed guidelines on specific issues relating to the application of data and scenarios held on the DDC and elsewhere for use in vulnerability, impacts and adaptation assessments. STARDEX Deliverable D16 Good practice guidelines produced as a part of the STARDEX downscaling "toolbox". The report gives recommendations on the more robust statistical and dynamical downscaling methods for the construction of scenarios of extremes based on three sets of criteria: robustness, application and performance criteria. ETCCDI guidelines These new guidelines on "Analysis of extremes in a changing climate in support of informed decisions for adaptation" follow a joint ETCCDI/ENSEMBLES workshop.